“Because, you can’t think big in a small car.” I’d asked my grandfather, Vernon Drury Case, Gramps to me, why he always rode in a limousine. We were in the back of his company’s black Cadillac limousine with my brother Grover (known as “G.G.” back then). Tommy, a handsome nineteen year old from Puerto Rico, was driving. It was a Saturday in late March of 1959. 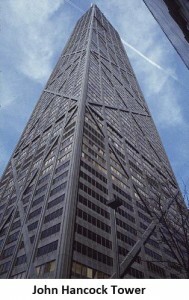 I was nine years old and we were headed into Chicago for the company’s annual pilgrimage to Saks Fifth Avenue. Two other carloads of kids would meet us there. 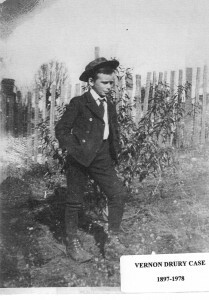 This was the third consecutive year my grandfather had taken all of the children of the men who worked at Case Foundation Company to Saks to buy them Easter outfits. He strongly believed every child should have at least one nice dress or suit of clothes and never be ashamed of how he or she looked. We made a stop at one of Case’s jobs on Wacker Drive so he could talk to the job superintendent. 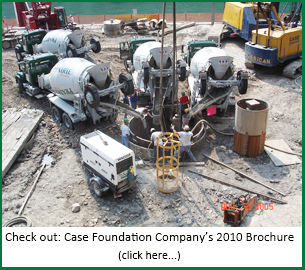 The crew was working overtime on the deep caisson foundations for a sixty story office building. When we arrived at Saks on Michigan Avenue the store manager and six salespersons were waiting on the sidewalk to greet Mr. Case. This would be a good day for us and them. 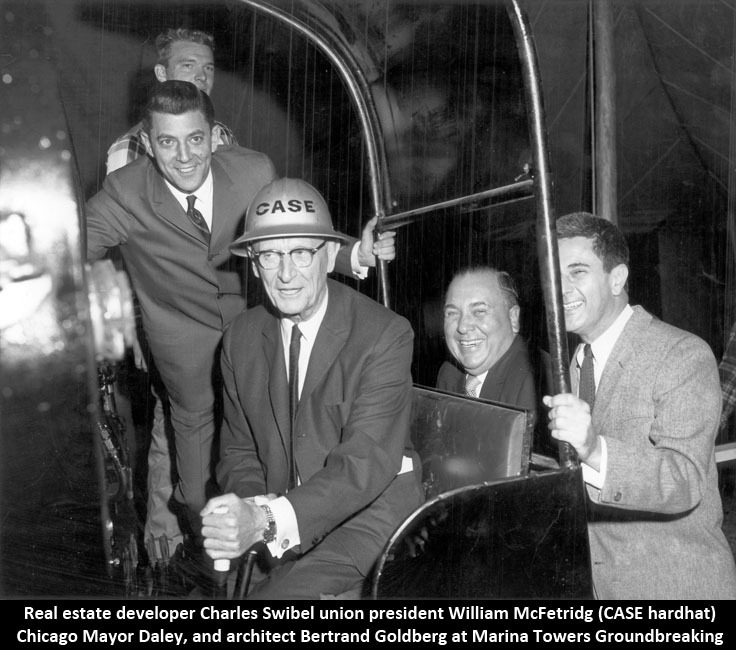 Vern Case did not always ride in limousines or shop at Saks. 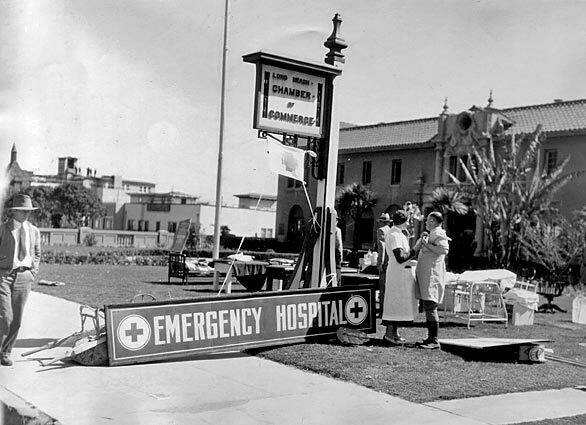 He was born January 15, 1897, in Orange County, CA. He was the third of four sons of Drury (Dru) Goldman Case and May Irene Thompson, both born and raised in Willits, a small farming town eighty miles north of San Francisco. For those into the ponies, the great racehorse Seabiscuit was put out to stud in Willits when he retired from racing in 1940. 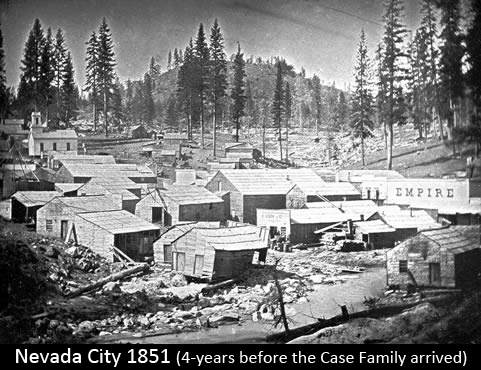 Dru’s folks, James Case and Melcena Sawyers were beckoned from Missouri by the great California Gold Rush and in 1854, with their two infant daughters, started their four month journey by wagon train. After crossing the Missouri River into Nebraska territory, they were attacked by Pawnee Indians. 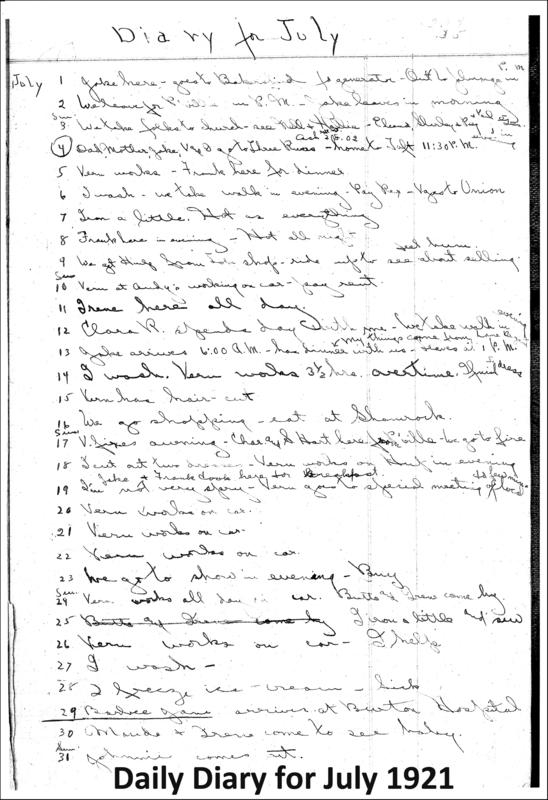 Melcena’s eighteen year old brother, Mountjoy King, wrote down the story. A few days after the attack they heard from some traders that the Indians lost nine men including their chief. 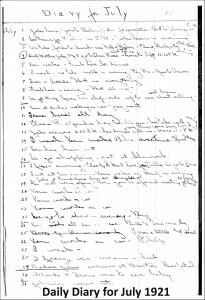 Only two of the wagon train party were wounded including Melcena who was shot in the shoulder. 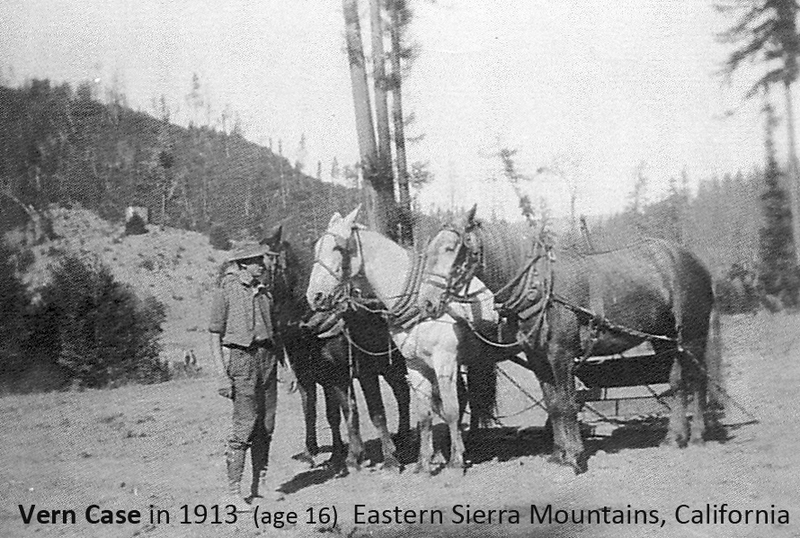 After crossing the plains, the desert and the Sierra Madres, the Case family finally arrived at the Rough and Ready Mine near Nevada City to strike it rich. They gave it up after two years of no luck and moved on to Willits and returned to farming. That’s where Dru and his older brother, Shady, were born. 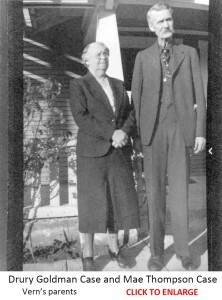 Dru and May Thompson were married in Willits in 1888. She was seventeen and he twenty-three. May was a member of the almost-famous Cameron clan that emigrated from Scotland in 1772 and settled in Georgia. 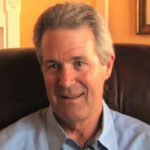 May’s grandfather, John Cameron, was born in Georgia and became a millwright and a Presbyterian minister. In 1825 he moved to Sangamon County, Illinois where, together with his uncles James Rutledge, founded the town of New Salem. They built a dam and a water powered sawmill on the Sangamon River. New Salem is where Abraham Lincoln spent his early adulthood. As he was studying law and making his first forays into politics, Lincoln fell in love with Ann Mayes Rutledge; James Rutledge’s daughter and Cameron’s cousin. They were engaged to be married in the fall of 1835 after the future President completed his law studies. 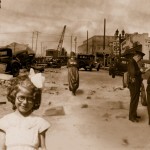 However, that summer typhoid fever swept the town and tragically claimed Ann’s life. In 1849 Cameron led a wagon train from Iowa to Sacramento, California, where he continued his ministry. 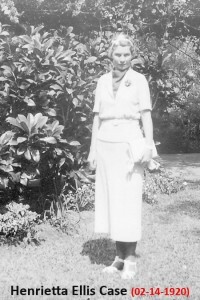 Shortly after their marriage, May and Dru moved to Orange County to live with May’s parents and Dru worked as a superintendent of a large beet plantation. 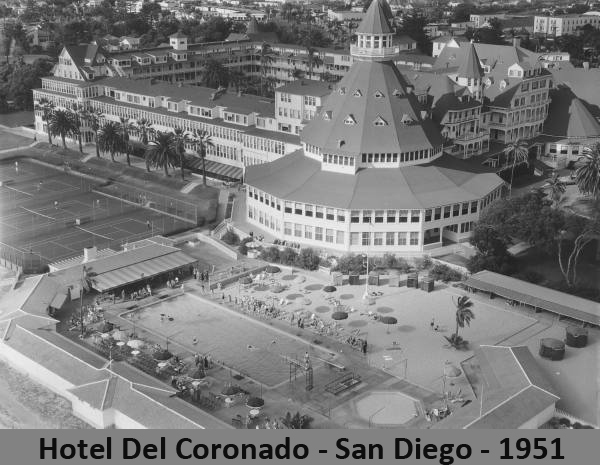 The first three of their four sons were born in Orange County: Franklin (Frank) Samuel in 1892, Hallie Cameron (Hal) in 1895, and Vernon Drury two years later in 1897. 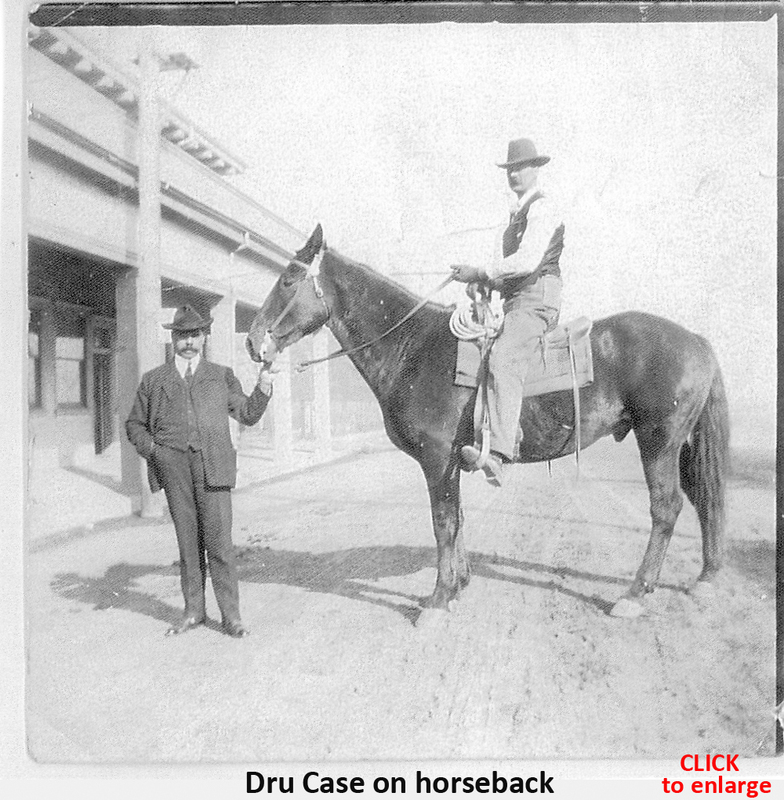 Dru moved the family back to Willits in 1899 to take care of his parents. 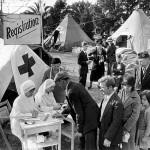 Although not thought too serious at the time, his mother, Melcena, had never fully recovered from the gunshot wound she suffered in the Indian attack and she and her husband, Jim, were of failing health. Dru and May loaded all of the family possessions into a covered wagon pulled by a team of horses and traveled on narrow dirt roads which in some places overlooked the Pacific Ocean. Vern’s high chair was tied to the back of the wagon and kept falling off. Hal, who was four at the time, vividly remembers Dru, in a fit of anger, throwing Vern’s high chair over the cliff into the ocean. Today, you can drive from Orange County to Willits in seven hours and fly it in one. It took Dru and his young family a month, including an overnight stop in Los Angeles, the first big city Hal and his brothers had ever seen. 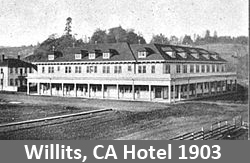 In 1901, 80% of Willits was burned to the ground by a great, wind-driven, fire. 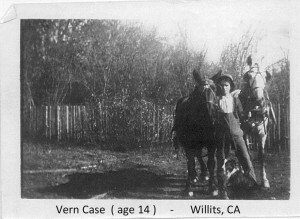 Vern’s younger brother, Foster Willits (Little Jake), was born in Willits in 1902 and Melcena passed away two years later in 1904. 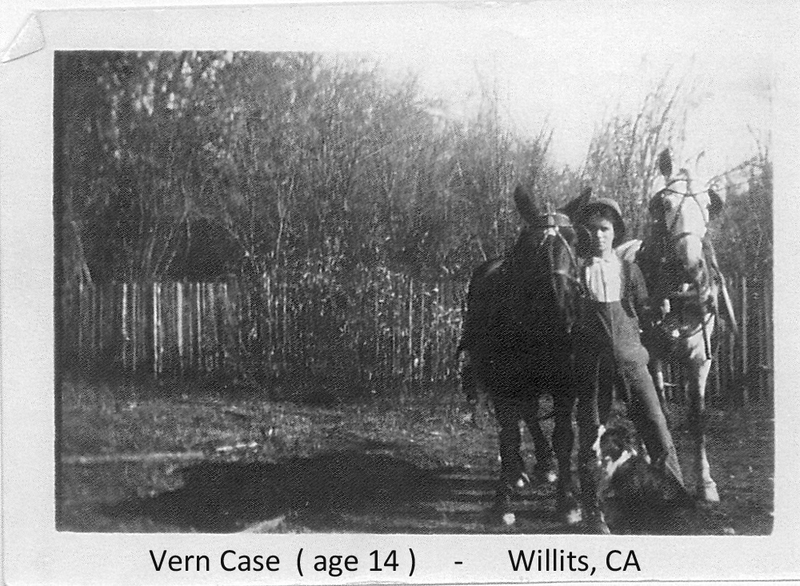 Vern was six years old at the time and Dru was working for the Northwestern Lumber Company taking care of the three hundred acres planted to feed the log-cutters and livestock. Dru also looked after the horse and mule teams used to haul logs and lumber down the mountain. They lived in a house owned by the company several miles outside of Willits, and the boys went to a one room school house with six other students. After a couple of years, Dru got a small homestead in Willits’ Little Lake Valley where he built a house and barn and farmed. 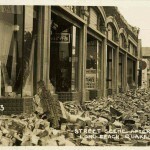 The great San Francisco earthquake struck in the early morning of April 18, 1906. There was a lot of damage in Willits. 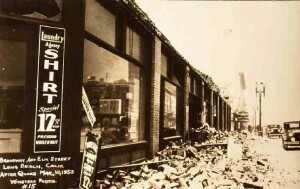 Several buildings on Main Street were destroyed and there was one fatality. 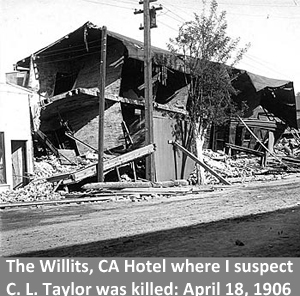 C. L. Taylor, the hotel manager, was standing on the balcony of his second floor room when it collapsed and he was buried by the bricks and rubble of the crumbling hotel.Dru was a man with a compulsive urge to work. He leased extra fields throughout the valley to plant grain and potatoes. He was never satisfied—every job had to be done over until perfect—every chore had to be done today, with nothing put off until tomorrow. Dru worked hard with little to show for it. The family lived hand to mouth, did what was necessary to scratch out a living and the boys wore hand me down clothes. Most of the folks in Willits didn’t think of themselves as poor as they were all pretty much in the same boat. But Vern did. He hated growing up with nothing. Vern didn’t have any fond memories of his father either. Too many times he and his brothers had to get him out of the saloons or off the streets where he’d passed out drunk and carry him home. Vern was humiliated. Dru put all the brothers out on their own by the time they were fourteen. His father passed away in Willits in July, 1939, while Vern and his young family were on a cross-country car trip in the Midwest. Somehow the police tracked them down and pulled Vern over to tell him the news. Vern couldn’t make it back in time for his father’s funeral. In fact, he didn’t even try. Like many kids in those days, Vern ended his schooling after the eighth grade and began working full time. In addition to farming, Vern had a number of jobs including one as a carpenter building flumes to carry water from California’s Sierra Nevada mountain range to the thirsty farming valleys below. 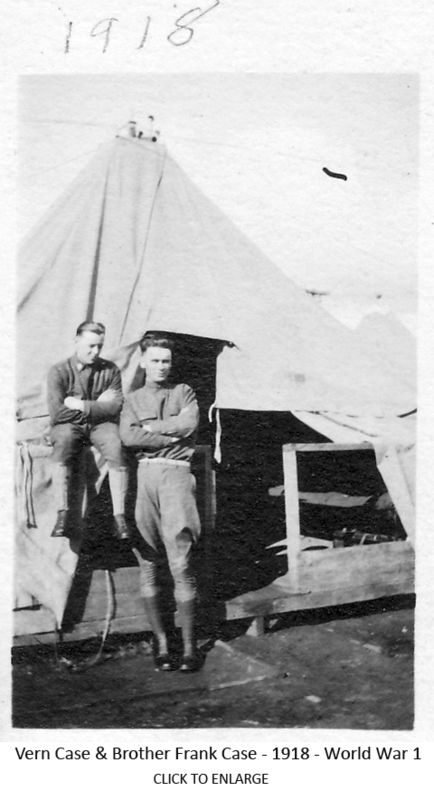 At seventeen he went to work in San Francisco as a construction laborer and in December of 1917 he enlisted with his brother Frank in the U.S. Army. His induction certificate described Vern as one month shy of his 21st birthday, dark blue eyes, dark brown hair, ruddy complexion, 5′ 10 ½” and occupation: skilled laborer. Vern was a late bloomer like me. He grew another five inches during the service. He did his basic training in Houston, Texas, and then was assigned to the Flying School Detachment at Payne Field, Mississippi as an airplane mechanic. He was fortunate and did not have to go to the killing fields in northern Europe. After his honorable discharge with the rank of Sergeant 1st Class in February 1919, the year my father was born, Vern moved back to central California, bounced around several construction jobs and met his bride-to-be Henrietta Ellis. 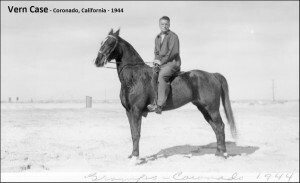 They were married a year later on Valentines’ Day, 1920 in Porterville, a small cattle and farming town about sixty miles north of Bakersfield. Vern had recently turned twenty-three, same age I was married, and Henrietta, a new school teacher, was twenty-two. 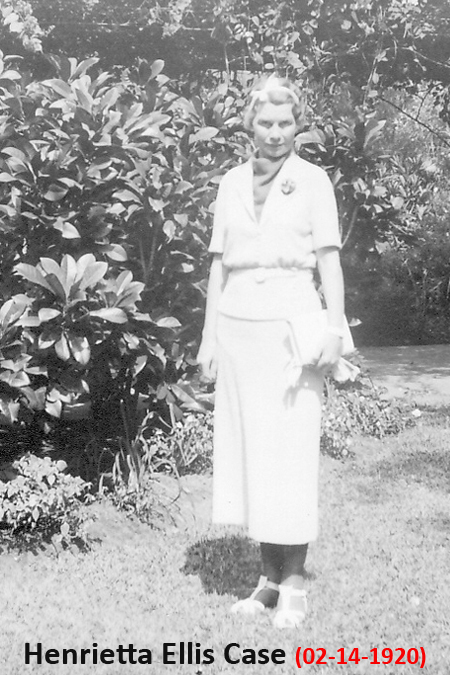 Henrietta had recently graduated from Fresno State Teachers College, which was a remarkable achievement for a woman in those days. 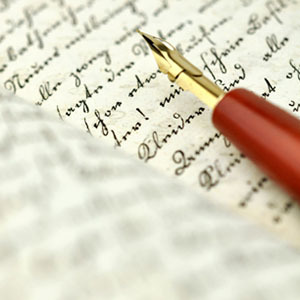 She was exceptionally bright and a prolific writer, penning numerous poems and short stories preserved in the family albums. Vern always credited Henrietta and her brains for his ultimate success in business. She was also tough, opinionated and a fierce competitor in both business and games. Henrietta was attractive, tall and full figured, with strawberry blond hair. However, she never thought of herself as pretty. One of her eyes was slightly crossed—some kids called her ‘walleye’—and she wore glasses starting as early as she could remember. Henrietta said the problems with her eyes were probably the result of her brother, Houston, four years her senior, holding her by the ankles when she was a toddler and dunking her head in a creek behind their house. 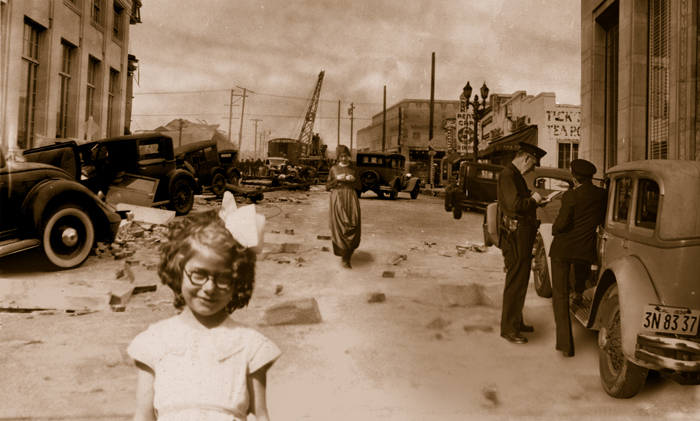 Houston didn’t mean to slam her head into the rocks that were hidden below the water.Shortly after they were married, Vern and Henrietta moved from Porterville to Taft in the southwest corner of the San Joaquin Valley where Vern hooked on with a drilling crew in the rapidly expanding oil fields. The town used to be called Moron, but changed its name in the early 1900s in honor of President William Taft, and also because the U.S. Post Master General wouldn’t allow a post office to be named Moron. 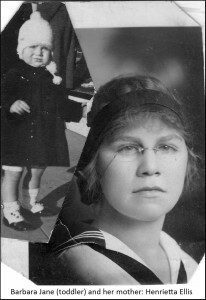 Their first child, Barbara Jane, my mother, was born in Taft in 1921. The young family was getting by, but only by the skin of their teeth. Henrietta religiously kept a daily journal and itemized very dollar Vern brought in from his work in the oil fields and what she made from part-time teaching. 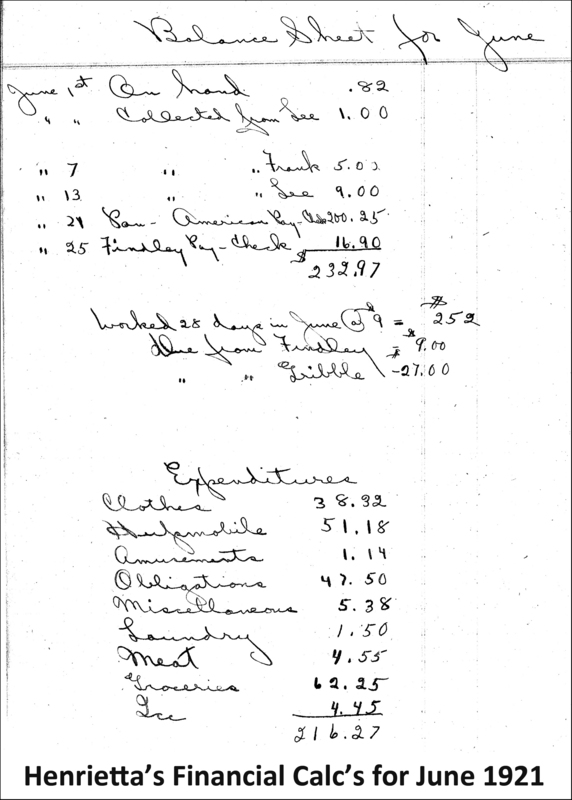 Her journal reflects that at June 1,1921 they had $0.82 cash on hand—eighty-two cents— Vern worked 28 days that month at $9 per day, bringing in $252, and they spent $216.27, including $.25 every day for ice. So that was a pretty good month. 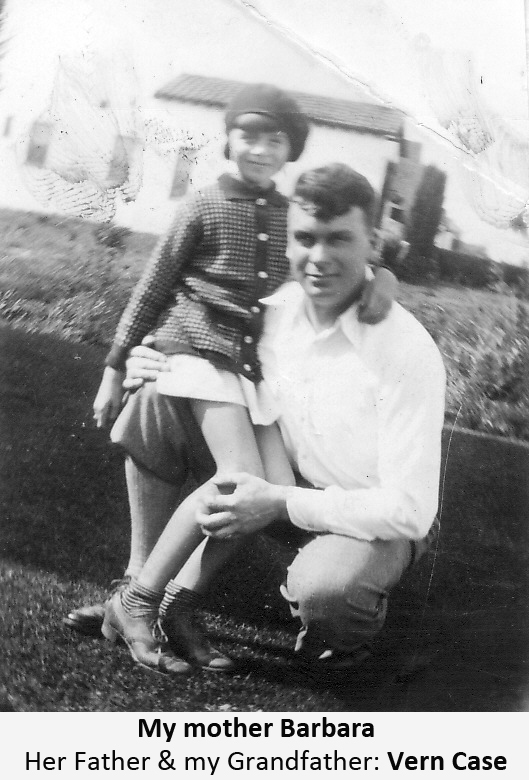 But shortly after Barbara’s birth, Vern was laid off and he headed to Los Angeles to look for work. Within a few weeks he found something and sent Henrietta some money, a blanket and bonnet for his “Barby,” and they boarded a train to reunite with him. In 1924 Vern got a job in the Bay Area with California Gunite Company owned by a Mr. Halloran, and the family moved to San Leandro. Gunite is a mixture of cement, sand and water sprayed through a gun at high pressure and is generally used to put a smooth hard surface on rough rock walls. When I worked the shaft job in Coalwood that summer in 1968, we’d periodically coat the walls with gunite to prevent loose rock from falling on us miners working at the bottom of the hole. 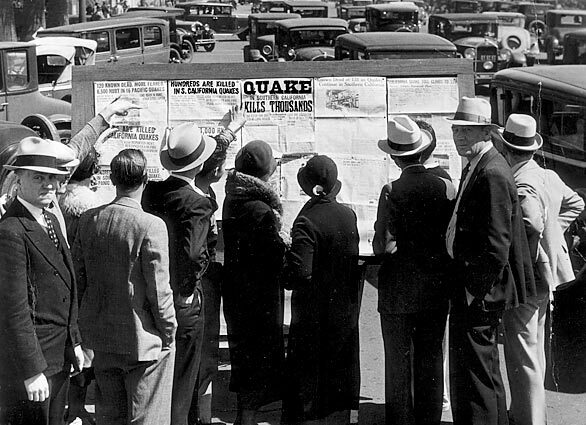 In the 1920s, Mr. Halloran discovered a more profitable use for gunite—making swimming pools. 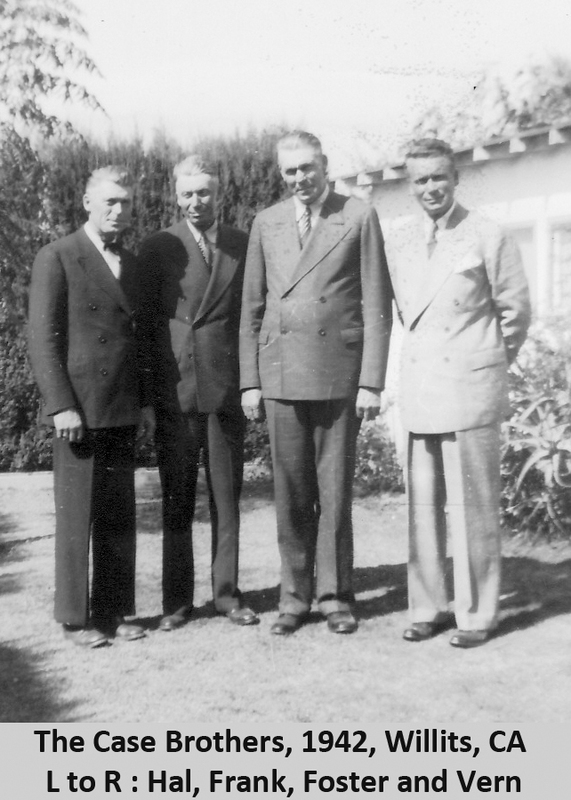 In 1927 Vern and the family moved back to Los Angeles and, with the same company, gunited the first swimming pool in L.A. There would be many more to follow. They rented a house on Prosser Avenue in Westwood. In October, 1929, twelve days before the infamous Wall Street stock market crash known as “Black Tuesday,” Henrietta gave birth to their son, Stanford Ellis Case. 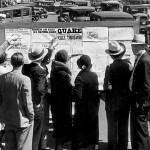 The U.S. stock market continued its precipitous fall for another month and this, along with a chain of other events, marked the beginning of the Great Depression. 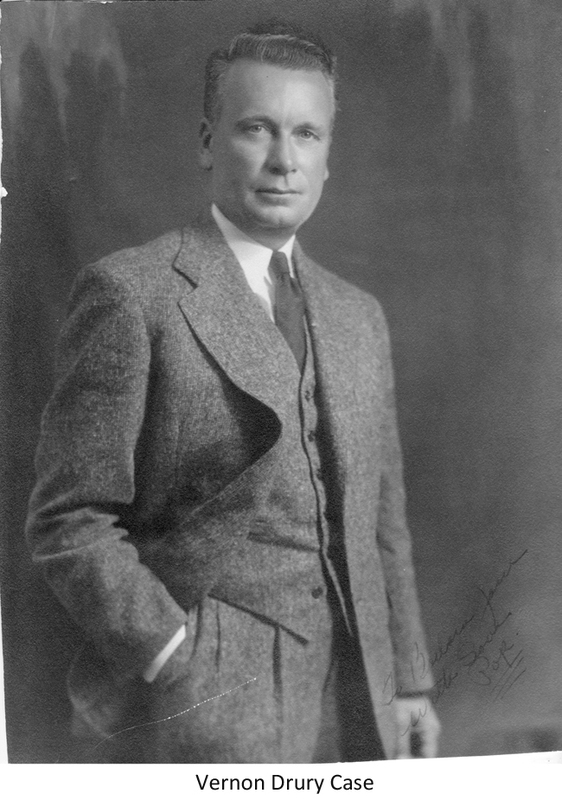 In 1930, Vern went to work for the American Concrete Pipe Company and moved the family to Dallas, Texas, where he managed a branch office. 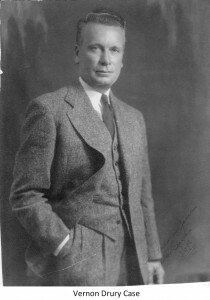 The president of the company, W.A. Johnson, was impressed by Vern’s work ethic and together in 1932 they formed Case Construction Company based in Long Beach, California. Mr. Johnson supplied the capital and Vern the sweat equity. 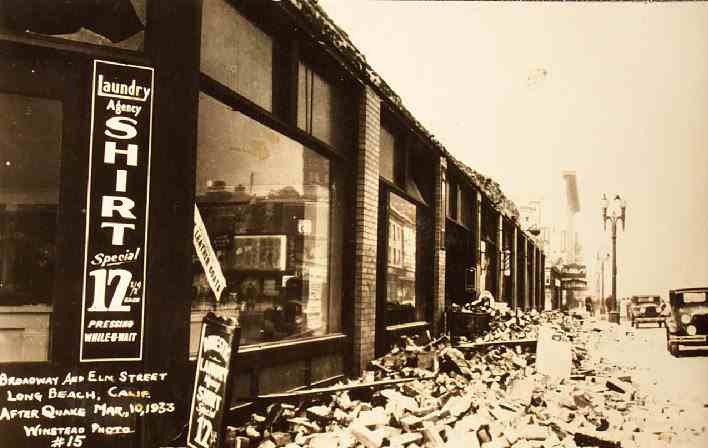 However, the country remained in the depths of the Depression, construction work was scarce, and the fledgling company struggled to stay afloat. And then Mother Nature dropped a big fat gift in the infant company’s lap. 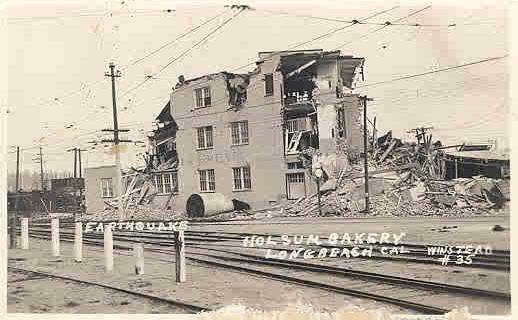 26 years & 10 months after the Great San Francisco Quake of 1906, Vern is again jolted by “Mother Nature” California-Style! 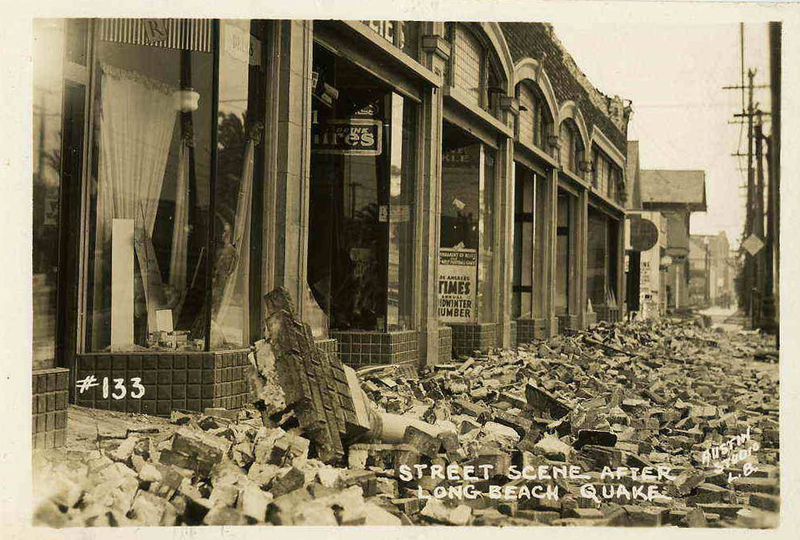 Vern and George were in the middle of the devastating Long Beach Earthquake—one hundred fifteen lives lost and a whopping forty-plus million dollars of damage done to buildings and infrastructure throughout the city. 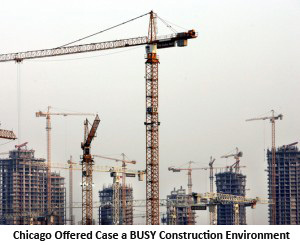 Within days, Case Construction was swamped with construction work. 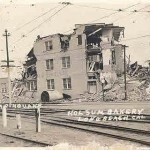 Thanks to the earthquake, Case Construction flourished, expanded into marine construction (dredging, piers, wharfs and jetties) and worked the entire west coast from San Diego to Bremerton, Washington. 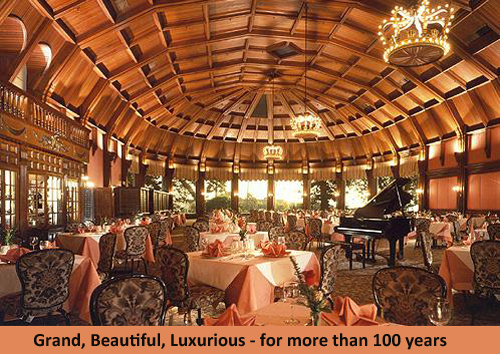 At the end of its first year of operations in 1932, the company had total assets of $28,736 and profits of $1,938. 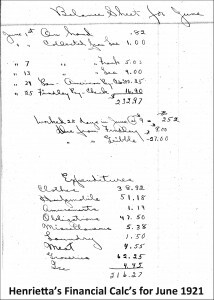 In 1943, eleven years later, Case boasted assets of $1,122,685, annual profits of $497,626 and a net worth of $750,000. 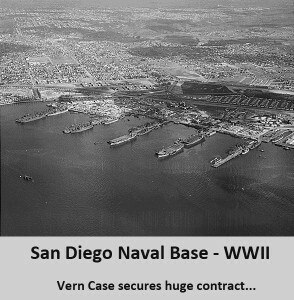 And that’s 1943 dollars!That year the company also secured a mammoth job from the Navy to dredge a deep water channel in San Diego Bay so the large World War II warships could navigate inside those protected waters. Vern, Henrietta and fourteen year old Stan moved into the landmark Hotel Del Coronado for the next two years. 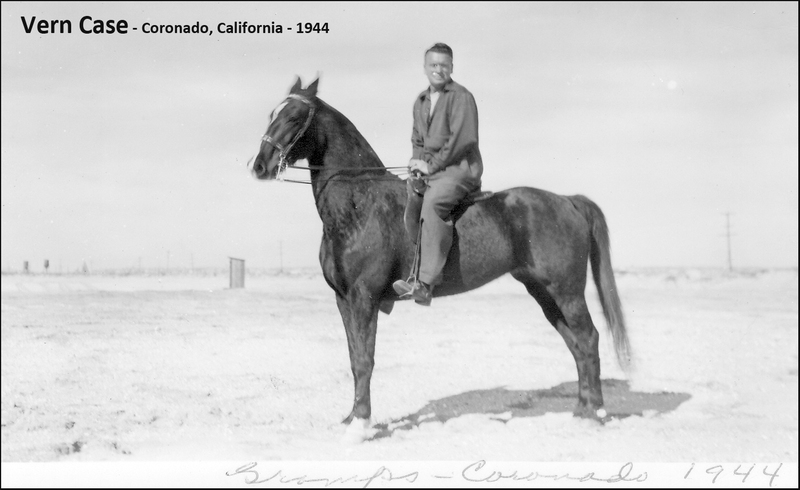 Vern stabled his horses nearby and often rode on the beach, known as the Strand, stretching south from the hotel into Mexico. 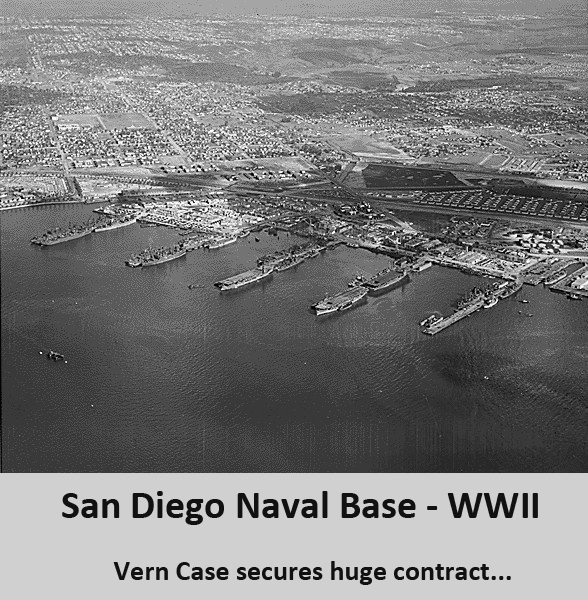 After the conclusion of World War II and completion of the San Diego Bay dredging job, Vern and Mr. Johnson dissolved their successful partnership. 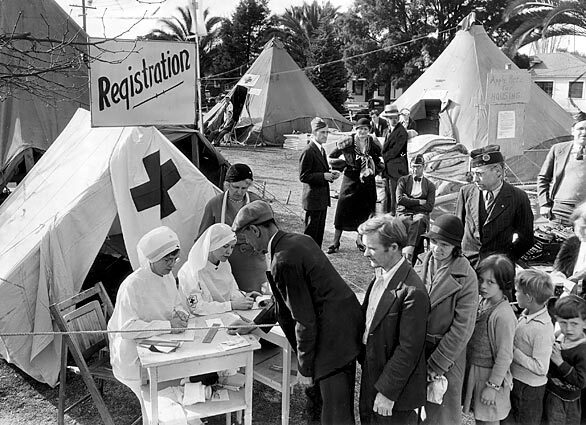 It was around this time that my father, Grover C. Gauntt, Jr., returned from two years of fighting for the United States Army in the South Pacific, married Vern’s daughter, Barbara, and went to work for Case Construction. Vern continued to do contracting work in California and in 1949 met George F. Casey, an early pioneer in the drilled shaft/caisson foundation business in Los Angeles. Caissons are holes that are machine drilled into the ground, sometimes one hundred feet in depth and ten feet in diameter, filled with steel rods (rebar) and concrete and upon which a building’s frame is anchored. 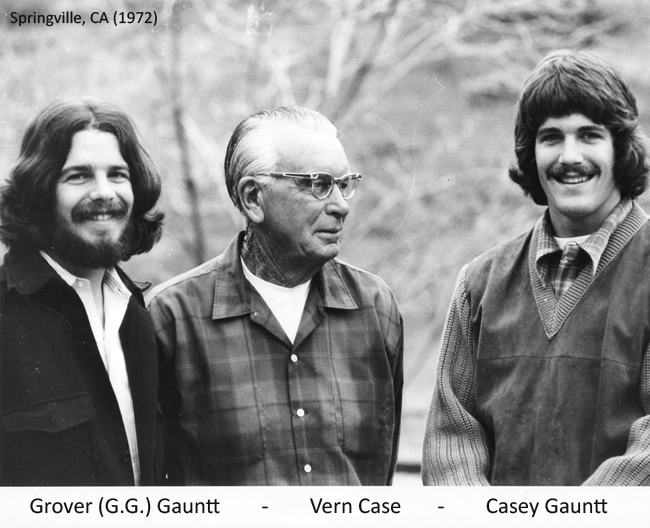 They formed a partnership, Casey and Case Foundation Company, and while George looked after things in Los Angeles, Vern traveled the Midwest and landed large jobs in Columbus, Indianapolis, St. Louis and Kentucky. 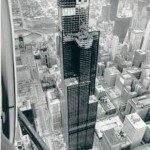 It was over the course of these trips that Vern became convinced the future of the caisson foundation business for large buildings was in the Midwest and not Los Angeles. 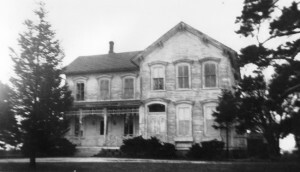 Within a few years, Case and Casey decided to go their separate ways and in 1952 Vern and Henrietta bought ten acres of farmland in Keeneyville, Illinois, twenty-five miles west of Chicago, with a seriously dilapidated Victorian-style house and several barely standing outbuildings. This became their new home and, eventually, the world headquarters of their very own outfit—their baby—Case Foundation Company. Henrietta was very reluctant to move to Keeneyville. They had put down roots in Los Angeles and all of their friends and family were in California. They had also recently purchased a fabulous five acre piece of property in Los Angeles’ prestigious Mandeville Canyon overlooking the Pacific Ocean and had plans for an exquisite home drawn up by the renowned architect, Paul Williams. Vern asked Henrietta asked to trade that for soy bean fields, harsh winters and strangers. She couldn’t turn Vern around and so she made the best of it. They ended up selling the property in Mandeville Canyon soon after the move to Keeneyville to raise more capital for their new company. There was no going back. 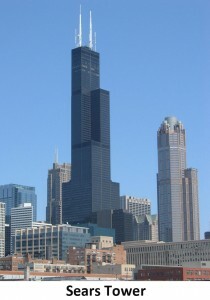 From a business perspective, the timing of the move to the Midwest could not have been better, for it coincided with the post WWII economic boom in general, and the coming to power in Chicago of Mayor Richard Daley, in particular, who was driven to rebuild Chicago into a major world class city and formidable business center. 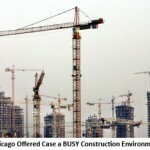 The construction industry loved Mayor Daley. 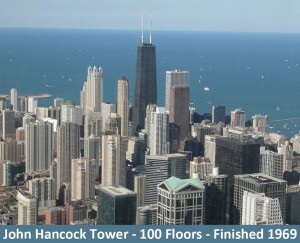 With a lot of thanks to the Mayor, Case Foundation will forever be identified with a significant portion of Chicago’s skyline having installed the drilled shaft foundations for many of the City’s dominant skyscrapers including Marina City, the Cabrini Towers, Trump Tower, and the one hundred plus story behemoths: Sears Tower, Standard Oil Building and John Hancock Tower. 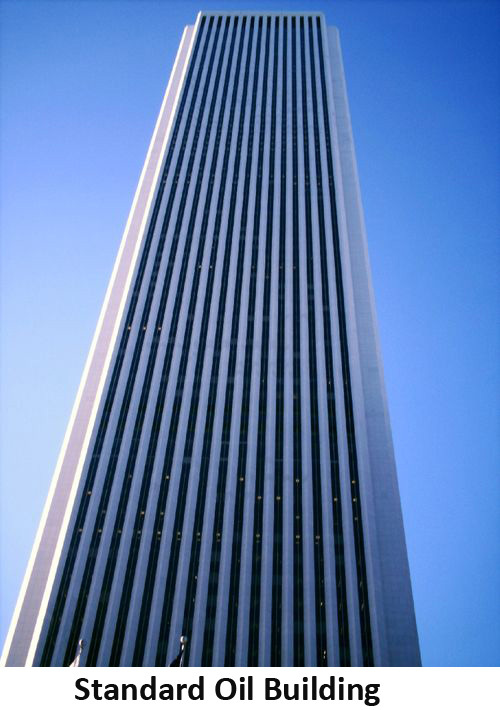 In 1952, my father opened an office in Detroit for Case Foundation where we lived for a couple of years, and in the early 1960s the company expanded its business into Latin America opening offices in Panama, Columbia, Puerto Rico and Brazil. Business was booming. The company was expanding. Vern was thinking and doing big. Vern would never acknowledge that his father, Dru, left him with anything but bad memories, but even he could not deny the prominent traits they shared in common— a prodigious work ethic and incredible drive. Vern had that additional intangible trait that is prevalent among most successful businessmen—he wasn’t afraid to take chances, leave all the chips on the table and risk losing it all. He was born broke and he made and lost small fortunes several times in his life. He and Henrietta rebuilt the house in Keeneyville into a small mansion and, although no Mandeville Canyon, one of the nicest homes within miles. He constructed a large two story building next to his house for the company’s offices and an equipment fabrication and maintenance facility the size of a large airplane hanger. Vern always had a hundred irons in the fire. He was ambitious and driven by an obsession with not having enough. He took immense pleasure in buying things for himself, but even more so for others. Because he grew up with little, he was consumed with a desire for plenty. For example, he loved to walk the stockyards on the south side of Chicago, several times with my brother and me in tow, to appraise the thousands of head of cattle, hogs and sheep awaiting their transformation to the kitchen tables. At least once a year he’d buy ten to fifteen head of cows and pigs off the lots and have them dressed by a butcher he liked in Chicago. He’d pay the butcher and also give him fifty pounds of meat as a tip. And then he’d drive around and deliver hundreds of pounds to family, employees, clients and friends. Many men have wine and cigar lockers. Vern Case had his own meat locker. Vern “died and went to heaven” when McDonalds opened its first restaurant in the Chicago area a few miles away from Case’s headquarters. He would sit inside with a cup of coffee and was transfixed by the mass production, sale and consumption of burgers and fries. It is a shame he didn’t live long enough to see a Price Club, Walmart or Costco. It would have blown his mind. Vern was a very generous man, perhaps to a fault. He had soft spot for hiring and rehiring guys down on their luck or fallen in the bottle. He fixed up one of the old buildings on the Keeneyville property into a small apartment and let some of these men and their families stay there until they made enough money to get a place of their own. Buck Mangin was living there with his family in 1957. I’ll never forget the first time I met him. I was seven years old and he was a tough, wiry Irishman with a crooked pug nose and several missing and broken teeth. When I shook hands with him it felt like he had given me his fist. I looked down at his hand and realized he was missing all of his fingers above the first knuckle. They’d been cut off in a job accident many years ago. He saw the shock on my face and both he and my grandfather unleashed peels of boisterous laughter. He was the superintendent on many Case Foundation jobs. Vern was a man who would give you the shirt off his back and then make you work for it. Vern was a natural leader. He was an imposing man standing six feet three inches and weighing two hundred thirty pounds. He had a huge head topped with a thick mane of salt and pepper hair. As soon as he started making a few dollars, he became obsessed with fine clothes and had all of his suits and shirts tailor made. One day when I was fifteen or so I went into the enormous walk-in dressing room next to his upstairs bedroom. Vern was a foghorn snorer and he and Henrietta had separate bedrooms for most of their married life. I counted eighty tailored suits, tuxedos and dinner jackets, fifty tailored white and blue silk shirts and twenty pairs of black dress shoes all by the same maker. When Vern came into a room he took control of it. His presence commanded attention and respect. And he made sure he was noticed. He had metal studs put in the heels of his black, hard sole, size thirteen shoes. In airports he walked fast and firmly down the middle of the passageways, his heels slamming against the tile floor and raising up a cacophony of reverberating “clicks.” In 1963, when I was thirteen, I went with him on a business trip to Los Angeles, and as we walked through O’Hare Airport to catch our plane I noticed everybody looked and many stopped to stare at this man dressed to the nines in his handmade three piece suit, shoulders thrown back, the felt hat with the wide brim worn up in the style of Franklin D. Roosevelt and the cashmere coat draped over one arm. They barely noticed the self-conscious young teen struggling to keep up with his head down to avoid any eye contact. 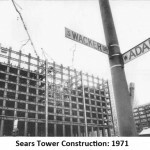 Thanks to Mayor Daley, O’Hare had recently undergone an enormous expansion and Case Foundation had done the bulk of the foundation work. It is no wonder Vern Case walked its halls as though he owned the place. 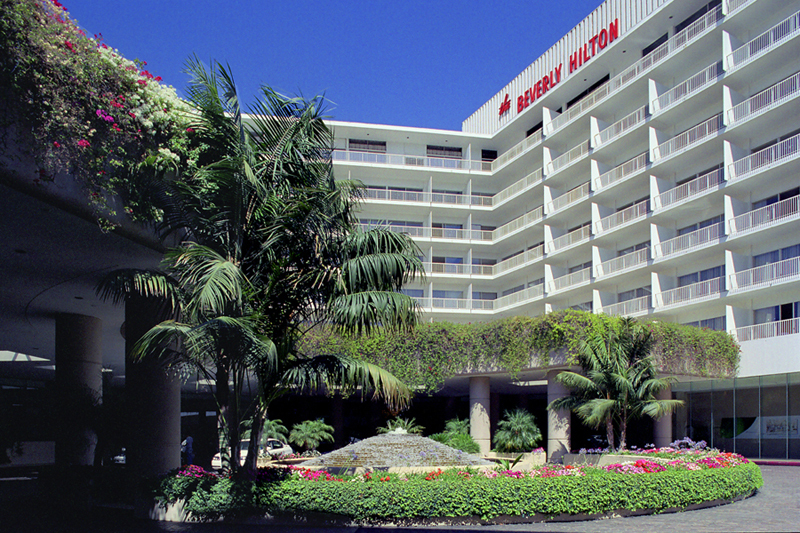 When we arrived at the Beverly Hilton Hotel, the bellman opened the door of our taxi cab and, with recognition spreading across his beaming face, exclaimed “Welcome back, Mr. Case! It’s so nice to see you!” Within seconds, and without exaggeration, ten hotel employees poured out the front door and lined up, commensurate with their rank, to greet my grandfather. “Oh, Mr. Case! We’re so happy to have you again, Mr. Case!” The hotel manager, concierge, receptionist, head chef, head of housekeeping, etc. It was as though the Lord of Edinburgh had arrived with the young Duke of Forth. In case you hadn’t already guessed, my grandfather was an extraordinary tipper. Vern Case was truly one of those men who was bigger than life and one of a kind. In the summer of 1961, he came up with the idea of a camping trip to Lake Kabetogama in northern Minnesota. ( Each syllable is pronounced in Chippawa like this: Kabe’-to-ga-ma – It means “Rough Water” ) It was a boys-only trip. Vern, my brother and I drove up from Chicago, and my father, Stan and his oldest son Mike, who was 6 at the time, flew in four days later. Vern said he wanted to “rough it” up in Minnesota for a couple of weeks. 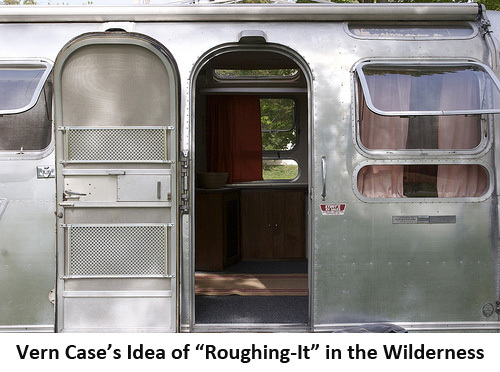 Let me explain Vern’s idea of “roughing it.” First, he bought a brand new thirty foot Airstream trailer and had it completely outfitted with beds, kitchen, dining area, and a bathroom with a shower. The Airstream was hooked onto his new black Cadillac limousine and Lupe, a twenty year old Case employee, chauffeured this rig and us up to Minnesota and stayed with us the full two weeks. It took a couple of days to make the drive and when we pulled into the rustic camp next to the lake, it was more than a little uncomfortable for my brother and me. The people that ran the camp and the other guests came out of their cabins or stopped what they were doing and stared with their mouths wide open. We could have just as easily landed in a spaceship. I assumed we’d all be staying in the Airstream or camping next to it. Oh, no. Lupe unhitched the Airstream in the middle of the campground and parked the limo next to the five fully furnished cabins Vern had rented: one for him (the snorer), one for Lupe, one for my brother and me and the other two for Stan and his son and my dad. As soon as we “made camp,” we jumped back into the limo and Lupe drove us into the nearby town to stock up on supplies. Vern and Lupe went into the grocery store and my brother and I stayed in the car and napped or fought; probably a little of both. About an hour later, we looked out the window and witnessed a parade led by Vern with Lupe and six bag boys trailing behind, each pushing a cart loaded to the gills with food and drinks. My grandfather thought it would be a nice gesture to buy food for the whole camp and all have dinner together every night next to the Airstream. God forbid anybody went hungry. No one actually stayed in the Airstream. Instead, it was converted into a big cookhouse. By the end of that first night Vern had taken over the camp and had made fast friends with everyone in it. That’s how he liked it. Our family has a saying we often use to describe Vern Case to others: “If one is good, ten is better.” He lived by this creed. Most of the time it was fine—other times, not so good. Half-way into the “camping” trip, Vern told my brother and me to gather all of our party’s dirty clothes. We were headed back to the market to get more supplies and the Laundromat next door. We loaded up ten washing machines and Vern went to the market and brought back several boxes of detergent. I’ve got to think he’d used a washing machine before, but maybe not this kind. My brother read out loud the instructions on the detergent box that suggested one cup of detergent per load. Vern measured out a cup and poured one in each machine. But, remember the creed. He proceeded to pour another five or six cups in each machine. “That’s better,” he smiled. We started up the machines and headed back to the market to restock the camp. We came out forty minutes later and there was a lot of commotion in front of the laundromat. The entire building was completely filled with soap bubbles and they were pouring out the doors and windows like a waterfall! Some guy, probably the owner, was yelling and running around like a chicken with his head cut off. Several folks had come out of the market and formed a semicircle in front of the place around Vern, Lupe, my brother and me. Even Vern appeared slightly embarrassed. As we drove back to camp a couple of hours later with our “super-clean” clothes, we all laughed our butts off. It was one of the funniest things I’d ever seen. And, of course Vern retold the story to the entire camp during chow time that night. Construction is a tough business. In Chicago, during the 1950s and 1960s, it was brutal. You didn’t make it by being nice or a gentleman. It was a street fight every day. The unions, the city officials and organized crime had a lot of power and influence, and they used it to the maximum. 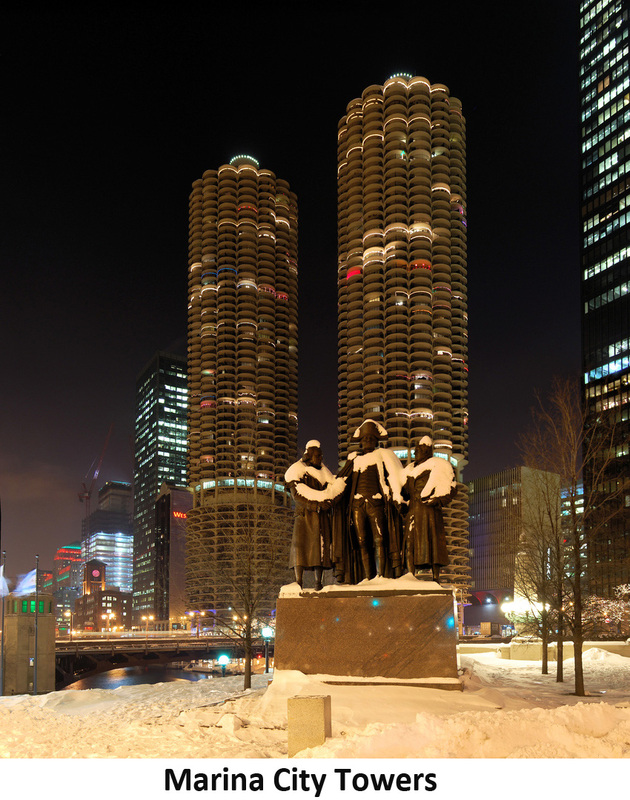 The ethnic groups in Chicago and their respective spheres of influence were clearly defined in those days. 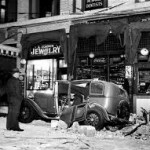 In the foundation business, the first and second generation Irish and Polish made up the bulk of the labor force; the Italians controlled the concrete and trucking businesses; and the third plus generations of northern Europeans ran the banks and insurance companies. 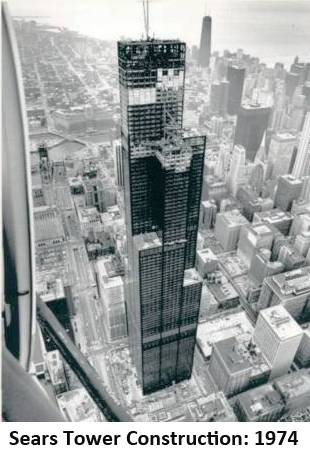 Mayor Daley and the other city officials controlled the permits, job inspections and the award of major public construction contracts. Up-and-comers and in-betweeners like the Scot-Irish Case clan ran the foundation companies. Vern spent money as though there was an endless supply of it. He would commit the company to jobs that were unusually risky or beyond its capabilities. “Make it work!” he’d bark: end of discussion. To tackle one particular job, they needed a drilling rig with enormous power to bore the designed caissons. There was no such rig available anywhere in the country for purchase or rent. So, instead of turning down the job as others implored, Vern decided, “We’ll build our own.” He hired a crony from California and moved him out to Chicago to come up with the design. The company sank over $300,000 into this piece of equipment, a huge sum of money in 1962. Case got the job, lost money on it and never used the machine again. 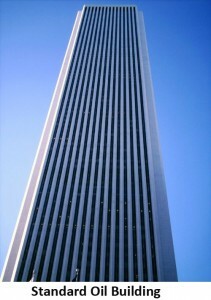 Vern was a visionary, a leader and a gifted salesman, but he did not have a head for finances. For one thing he didn’t have the education, and too often he didn’t listen to those who did. 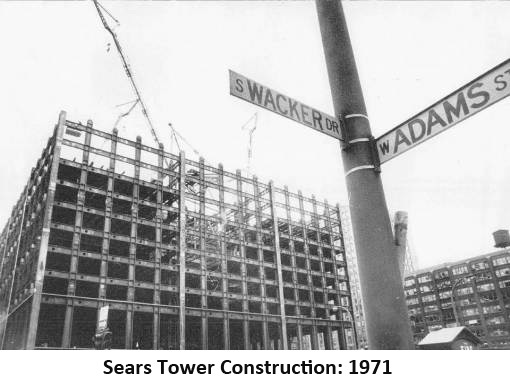 My father often referred to the construction business as a roller coaster. With my grandfather at the helm, it was a very wild ride indeed. As I mentioned, he wasn’t the type to take chips off the table. Vern could have easily retired in 1949 with all the money he and Mr. Johnson made in Case Construction, but that was not in his nature. Vern always wanted to land that next big job, get bigger, borrow more money and extend the company to greater heights even it meant going beyond its limits. It was in his blood. His grandparents came West in covered wagons with nothing other than a dream to make a better life and maybe strike it rich. Vern’s folks were dirt poor, and so was he until he finally began to hit his stride in his mid thirties. Vern didn’t like having nothing, but he wasn’t afraid of it either. I think that’s a big reason why he was able to achieve so much in business—he knew, deep down, he could survive losing it all. He’d been there before. 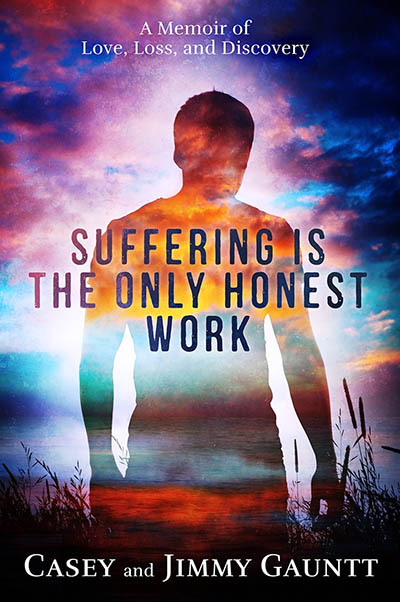 However, one of the problems with that is those around you, or working for you, may not share that same philosophy or have the wherewithal to handle it in the same way. My father was one of those who didn’t and, ultimately, couldn’t. In addition to his name, I inherited a lot of things from my grandfather such as my size, work ethic, leadership qualities and generosity—however, taking inordinate amounts of risk was definitely not one of them. Working for Vern was hard, and doubly so if you were his only son and son-in-law. Vern set the bar high and if you didn’t meet his expectations, he let you know it. He wasn’t any easier on his grandsons. I was eleven years old that first of eight consecutive summers I worked for Case Foundation, and my brother’s and my job was to paint the eight foot wooden fence that encircled the ten acre headquarters property in Keeneyville with a white, oil based enamel. We couldn’t use a roller—only brushes—and it seemed like more paint ended up on me than the fence. I can still recall the smell. We were too short, and the fence too tall, so scaffolding was set up so we could reach the top. We got paid fifty cents an hour. Occasionally I’d get tired and sit on the scaffolding. One time in this position, I saw my grandfather exit the office building and march towards me with an angry scowl on his face. “Stand up!” he barked. “Now listen to me—don’t ever let me catch you sitting down on the job again. It makes you look lazy. If you’re tired then go home and you can rest up the rest of the summer. But when you work for me, you work like a man, standing up. If you need to go down to one knee from time to time-that’s OK. But never, ever, sit down!” And with that, he spun around on his black wingtips and “clicked” back to the office, the metal studs in his heels slamming against the concrete parking lot. In 1963 after six years with Case Foundation and toiling for his father, Stan had enough and moved from Chicago to the California Bay Area to establish his own foundation company. Stan had his father’s drive to become independent and be his own boss. My father had those same qualities, but he was never able to fully extricate himself from Case Foundation and Vern Case. Well, he ultimately did, but I’ll get into that a lot more later. 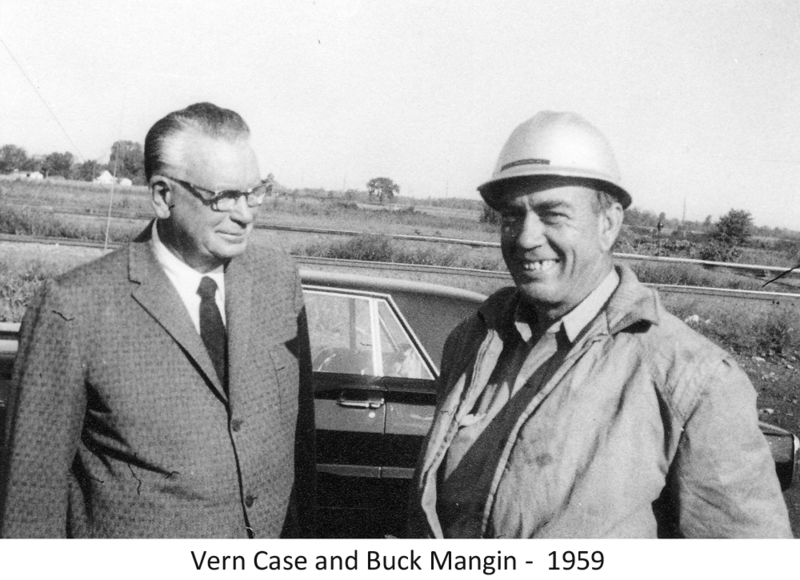 Vern retired from Case Foundation in 1968 and a couple of years later sold the company to some of the employees not including my father, which was just fine with him. Henrietta and he moved to Springville, California, a tidy little town in the foothills of the western slopes of the Sierras and only a few miles from Porterville where they were married. They purchased a small house on a large corner lot which Vern quickly remodeled into the nicest place in town, just like he had done with their property in Keeneyville. Soon after my father’s suicide in December of 1970, my mother and sister, Laura, bolted Chicago and moved in with Vern and Henrietta in Springville for six months before resettling close to Stan in Los Altos in the Bay Area. In 1974 Henrietta and Vern moved to Los Angeles but kept their place in Springville. Laura had recently started USC and Barb decided to move from Los Altos into the Sharon Towers apartments in Beverly Hills to be close to her daughter. 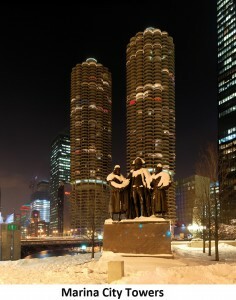 Vern and Henrietta took an apartment in the same complex. 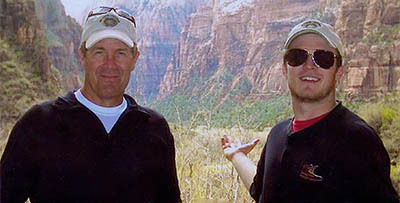 The entire family continued to reel from my father’s death, and there was a compelling need to be close to one another. My wife of one year, Hilary, and I lived in a small house in East L.A. while I finished law school at USC, and my brother, Grover, lived in a bungalow in Hollywood. 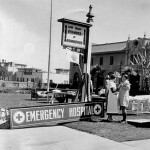 My grandparents also wanted to be closer to their physicians. Vern had recently been diagnosed with prostate cancer and Henrietta continued to battle chronic hip and back pain. In 1976, while placing a phone call to a friend, Henrietta suffered a massive heart attack and died before she hit the ground. 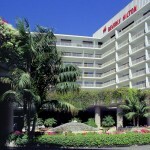 Shortly after her death, Vern took all of the family to Hawaii and then crisscrossed the country the following two months to visit his friends and former business associates. 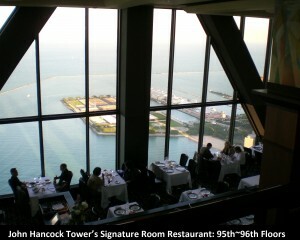 He spent several days in the Chicago area hosting lunches and dinner parties. One evening he rented out the famous Signature Restaurant and Lounge occupying the 95th and 96th floors of the 100 floor John Hancock Tower that he poured the very foundation for and invited over a hundred people for drinks and dinner in the skyscraper he birthed. ChicagoInno pointed out that it’s unclear why the work on the antenna is being done in the first place, but it noted that the antennas were bought by an investor in 2012 for $70 million. All of Case Foundation’s new owners and employees were there at the top of Chicago and earlier that day he took several of their wives on a shopping spree at Saks Fifth Avenue where “Mr. 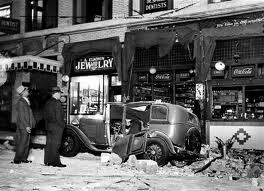 Case” was once again warmly greeted by the sales staff. His son, Stan, was livid when he later found out that Vern had spent a huge chunk of his savings on these trips. “Some things never change! This man continues to spend money like there is no tomorrow!” As it turned out, that was Vern’s farewell tour—there was no tomorrow. Upon his return to Los Angeles, Vern was diagnosed with pancreatic cancer and he passed away three months later. During his last couple of weeks we visited him often. He was in considerable pain and receiving round-the-clock home nursing care. He’d be in the middle of a regular conversation with us and then begin to talk to people we couldn’t see. He was always on a construction job. “George, you’ve got to move that bucket rig over there, next to the casings. No, Tom! We’re going to drill that caisson last, but get this one ready for inspection by Friday.” It was eerie. He was having lucid conversations with his employees, barking out orders and answering questions. I didn’t recognize most of the names he used. Stan said many of the guys he was talking to had worked for Vern forty or more years ago.Vern had already begun his journey to whatever is next. He was doing what he loved: being on the job, hard at work, leading men, living large and thinking big. He passed away on August 18, 1977 at the age of eighty. A modified black Cadillac limousine picked up Vernon Drury Case and he rode in the back, one more time, on to the next job.